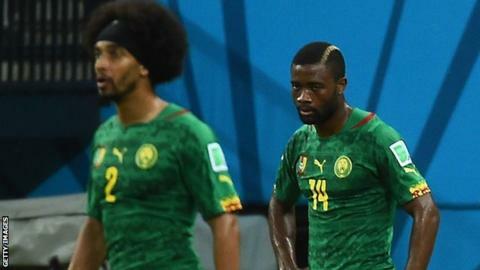 Cameroon President Paul Biya has called for an inquiry into the country's poor performance at the World Cup. The Indomitable Lions lost all three group games in Brazil, had a player sent off and saw two team-mates fight on the pitch. They were also the first African team to be eliminated, conceding nine goals and scoring only one. Prime Minister Philemon Yang has been ordered to open an investigation into the causes of the problems. A statement on Cameroon radio said: "The President of the Republic, President Biya, instructs the Prime Minister, Philemon Yang, to open investigations on the causes of the unfortunate participation of the Indomitable Lions at the 2014 World Cup in Brazil. "He should provide results within a month and make proposals for a deep and urgent reconstruction of Cameroon football." Cameroon were beaten 1-0 by Mexico in their opening Group A match, thrashed 4-0 by Croatia and slumped to a 4-1 defeat by hosts Brazil. Alex Song was also shown a red card for elbowing Croatian striker Mario Mandzukic - an offence for which he was given a three-match ban by Fifa - while Benoit Assou-Ekotto headbutted his team-mate Benjamin Moukandjo during the same game. Cameroon coach Volker Finke called the behaviour "disgusting".